What are you “feeding” your feet? We spend time a lot of time researching and eating the right foods for health… and yet few people think about their feet! Shoes with heels or that crowd toes together are NOT GOOD! They lead to foot problems/weakness, bunions, and more. Personally, I don't even like how heels look, now that I know how bad they are for us. I know people think they are fashionable, yet I don't. I think they look crippling and painful. My husband is actually the one who started hunting for healthy shoes a few years ago. I quickly joined him because it made so much sense. In fact, I wonder how I missed the boat on this for so long. But take it from me — it's never too late to make better choices, and I'm really glad I did! Here's what we look for in shoes, and more importantly — why. These are shoes with a “zero” heel drop so the shoe doesn't elevate one's heel at all, nor change natural footfall or alter natural spring… all for safe, strong, and energetic walking. Healthy shoes don't smoosh toes together, but rather allow them to splay out naturally as they should. This retains their God-given shape (and less chance of bunions!). I'm always stretching out my toes to improve their flexibility and “splay” — to undo the affects of the crowding they experienced for all the years I did wear heels or undesirable shoes. I have recovered quite a bit of splay just by doing this regularly! A low profile sole allows my feet and body to feel the terrain and make adjustments, rather than my senses be dulled through cushioning. I prefer shoes made with natural materials, leather if possible. My sandals (pictured below) have a leather footbed so they don't stink! EVER! And leather lasts much longer than cheaper materials. I try NOT to wear shoes as much as possible. Because that's the absolute best! I even work out without shoes as often as possible. And if I do wear shoes for working out, I very often use my leather Shamma Sandals. Because I walked a bit duck-footed for most of my life, now when I walk around, I make a concerted effort to turn my feet inward and more straight, retraining my feet into a more stable and balanced walking motion. I'm working on the path of my footfall; putting my heel down first, then walking while shifting my weight from heel to toe, kind of rolling on the outside of the foot, then lift off. There is a “proper” way to walk; you can search YouTube for quick videos that show the healthy motion! It's a little bit spiritual for me. Just like we changed our diet years ago to honor God's design for our nourishment, I try to do that with my entire temple… including my feet. God gave me a strong and able body, with strong feet. So to the best of my ability, and while leaning on His strength and providence, I am choosing the apparel and habits that maintain that strength and His design… all so I can serve Him and my family better. God sustains my every breath. He gave me a body and a responsibility to care for it. If I care for it by doing the things I know to do, then I am more able to love and serve Him and others. That's my motivation. To love God and my family more! To serve more! It took some effort for me to change myself (and I'm still working on it) but I believe it's worth it just for that. 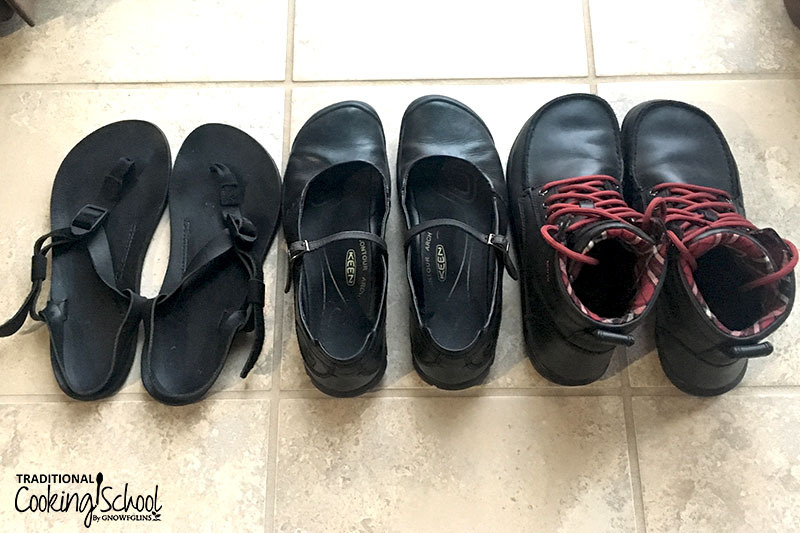 Also… if I was having children again, I would keep them out of shoes for as long as possible (which our daughter is doing with her son) and I would NEVER put them in normal shoes once they needed them. Only “zero shoes”! 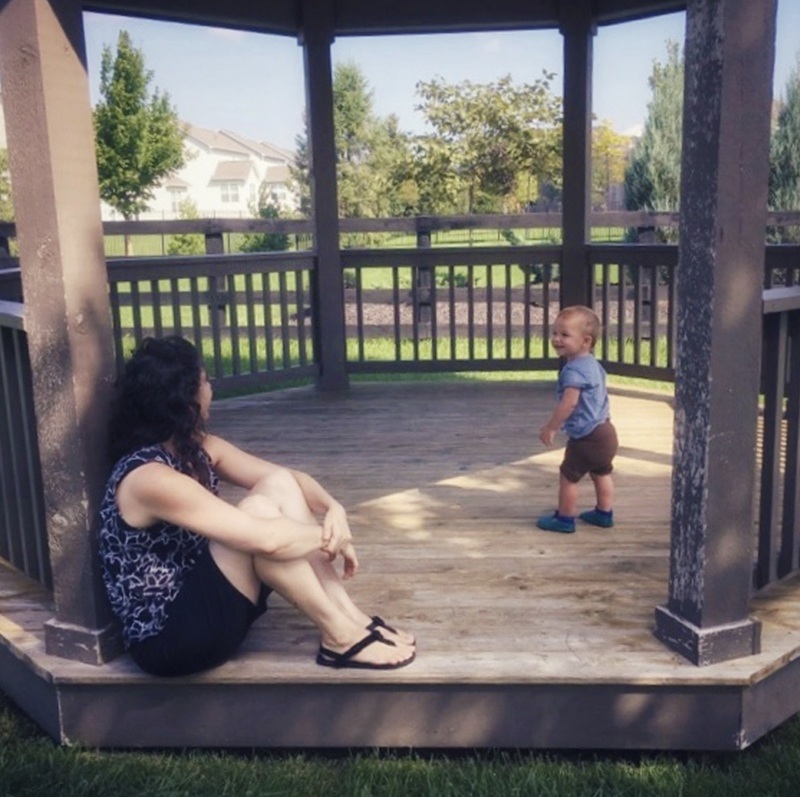 Speaking Of Children… Are There Zero Or Barefoot Shoes For Kids? Yes! 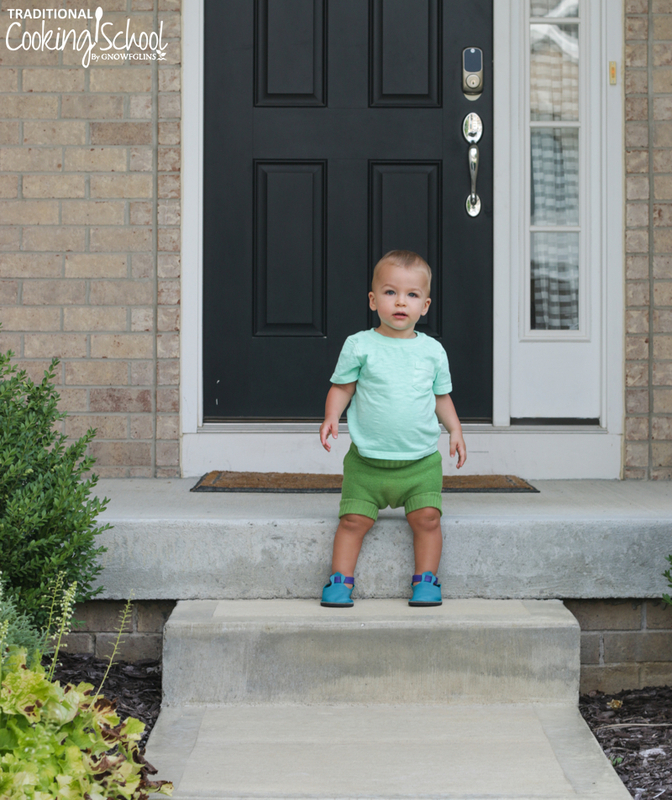 As pictured above, my daughter's son LOVES his minimal leather moccasins from Softstar Shoes. They are so soft, and protect his feet while allowing him to feel his environment. They have no heel and provide plenty of space for his growing baby toes. You might also consider Vivo Barefoot — another good option although not all are made from natural materials. Sandals, my summer shoes, even for long walks! — from Shamma Sandals, classic All-Blacks in full leather. Mary Janes, my spring/fall shoes when it's too cool for sandals but too warm for boots — from Keen, not sure of the model or if they're available any more! When the elastic at the buckle wore out, I got them repaired because I love them so much. However, these Keens are not quite zero heel, which I didn't know about at the time I purchased them. What about for men? My husband has a pair of Luna sandals and Lem's Boulder Boots. Softstar Shoes and Vivo Barefoot also sell a variety of barefoot shoes for men and women, although no one in my family owns a pair (yet). 🙂 You might also check out the Aurora Shoe Company and The Drifter Leather for more healthy shoes for adults made from natural materials. Baby Boy and I went to the park in our “zero” shoes! What Happens When You Switch To Minimalist Shoes? Just a warning for you so you're not surprised by what happens if you start wearing minimalist shoes or “zero shoes”! It may take some time for your feet to adjust. They may actually hurt quite a bit for a few days/weeks as the muscles get strong again. I got through this years ago when I switched to a standing desk. My feet and legs hurt for a good two weeks. A pain I had never experienced before. People told me to wear shoes to help the pain. I hate shoes, though, so I did it barefoot anyway and finally got through it in about two weeks. For me, it was worth the pain, because now I'm on the other side! At the beginning of this summer, when I first got my Shamma Sandals, if I took an extra long walk in them, my feet felt a bit sore afterward. With walking all summer, my feet are getting stronger and walking is a breeze now. Unless I go extra-extra-long! The point is: you have to work up to it as you build up your foot strength. 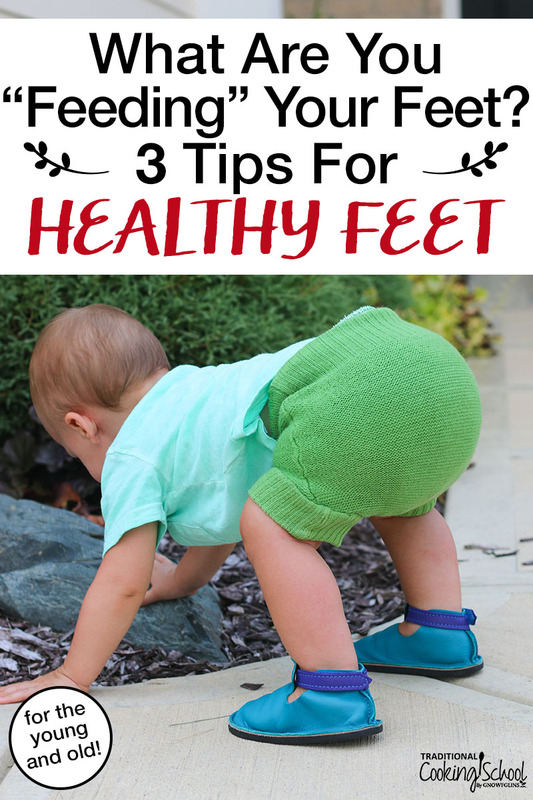 What are your tips for healthy feet? Do you wear shoes made from natural materials, with a zero heel drop and open toe bed? Disclaimer: I’m not a doctor. All information is intended for your general knowledge only and is not a substitute for medical advice or treatment for specific medical conditions. There are certain foot conditions for which minimal shoes are not recommended. You are responsible for your own health and for the use of any remedies, treatments, or medications you use at home. God bless you! While I agree with most of what you have said I do not agree with the not putting children in proper shoes when starting to walk. My Mom put me, my sister and all our children in the very expensive English leather baby shoes, all leather, almost zero heel and very wide in the toes, fairly high, very strong hard leather sole. My Mom believed and generations that could afford them did, that proper support while starting to walk promoted proper walking stance, balance, feet at the correct angle, etc. Thank goodness that she did, every one of us walk properly, none of us have pigeon toes, walk duck footed, etc. She always said, second hand clothes were fine, but NOT second hand shoes, if funds were limited put it in to proper footwear until they were full grown. Every time she saw someone walking either pigeon toed or duck footed she would cringe and say that could have totally been prevented or greatly helped. I am not sure that you can even get those shoes here any more, but I am very glad that they were available for my family. Thanks for the information. Do you know if these would be okay for someone who has plantar fasciitis and a high arch? I have a really hard time finding shoes that give me the support that I need. I am on my feet a lot and on concrete. I read reviews and testimonials that some people have experienced relief from plantar fasciitis with zero shoes. very interesting but IS SOLE OF SHOE MADE FROM MATERIALS THAT ALLOW FOR GROUNDING. ???? to me this is very important. We would recommend that you contact the manufacturer to determine what the sole material is. Some of the shoe manufacturers we recommend have information in their FAQs about grounding. I go barefoot as much as possible or I wear a good flip flop I wear them as long as I can till it is just too cold. I never heard of the shoes you describe but will look them up I also soak my feet in epsom salt often and go for pedicures. I believe if your feet is good your body will be happy! Definitely worth it going as bare as possible. I also prefer leather shoes as they mould to your feet but have not quite done the zero heel in some. Winter boots are all soft and zero heels though and in summer as we are going into now, barefoot as much as possible but I did get leather T bar shoes for dressing up a bit, they have a 5 mm heel which is almost zero. In South Africa, we love our “vellies” a zero heel lace up leather shoe for men and women and my new pale pink ones are arriving in the ,mail soon. I love UnShoes! My husband and I were in Cedar City Utah a few years ago for work. We met the owner and bought some shoes from him. I just love their family business (our family has a business, too) and I wear his shoes ALL the time. I have just about worn them through. I am so excited that he has closed toe shoes now, I can give up the mary-janes I bought in 2005 and get some new shoes to wear to Church in the winter! I have so many painful things wrong with my feet. My acupuncture doctor said that the b st thing for our feet is to go barefoot. And to graduate from soft surfaces to outside. My feet feel like I’m walking on gravel when I’m wearing sketchers ( a symptom of a condition) so that is going to be a challenge. I tell you this to confirm what you are saying. Also my first was born 27 years ago and I delayed shoes with each of my children Because I had heard that was the best thing. Curious to know if Birkenstocks and similar shoes fit within the minimalist shoe family? (I’m suspecting that they do not.) They seem to have zero heel drop, but the high arches would of course affect the natural fall of the foot. I am also wondering how someone with very high medial arches would fare with minimalist footbeds. My arches are so high that the flexing of my foot causes huge calluses on balls of my feet (metatarsal arches or the lack of them) — I have to thin them down on a regular basis or the buildup becomes very painful. Any insight? Birkenstocks are zero drop with a wide toe box but the sole definitely isn’t flexible or minimal. It’s possible that zero shoes would not work for you because of your high arch, but we don’t know. This may be one of the issues for which zero shoes don’t work. You could still seek out wide toe box, natural fibers, etc. and still have arch support because you needs it. I wore Birkis for years and loved them, but gripping with my toes to keep them on is likely the reason for my ball of foot pain. Reading Katy Bowman books and wearing Zero brand shoes is helping.